Then there was the day again, when I should change my location. By bus, of course. At the bus station, I realized that I still have the hostel key in my pocket. I'm an idiot. But the friendly bus staff kept the key and I could tell the hostel owners, by the way another collective, where they can pick it up. In Antalya, I organized a couch again. In the western part of the city, I was allowed to spend a few nights at Goncas (TR) place. Gonca works at a bar in a concert hall and lives together with her roommate Merve. Both are great, funny, experienced couchsurfers and we became friends immediately. Already on the first evening I unpacked my guitarlele and we sang together while eating a good cup of tomato soup. An excellent start. And also on the following days, the two had to work during the day, we had always a lot of fun, even if Gonca split up with her girlfriend only a few days ago. Of course, I went to explore the city. I took the bus to the Cam Pyramit, this pyramid is used as a trade fair center and there was a book fair that day. 4 books are all I have seen in English. The zillion others were, of course, in Turkish. But it was still exciting to stroll around the publishers and see what the Turkish book market has to offer. At the fair I met Aylin (TR). She is a student teacher and because we liked us from the beginning, we also spent the day together. She wanted to show me her city on this, as well as the following day. So in Antalya I had the opportunity to get to know the people and not only the tourisitc Antalya. We have experienced cool things, which I have edited here briefly. Antalya is a very interesting city. Particularly noteworthy is the steep coast to the sea. There are only two beaches on the west and east coast of the city. The city ends with an almost continuous park directly at 40m deep cliffs. Only a few kilometers into the country, a magical mountain and rock panoramic sourrounds the city. Up to 3,500m high mountains and fantastic rock formations as well as the sea give you a 360 ° nature view, even if you are in a big city. 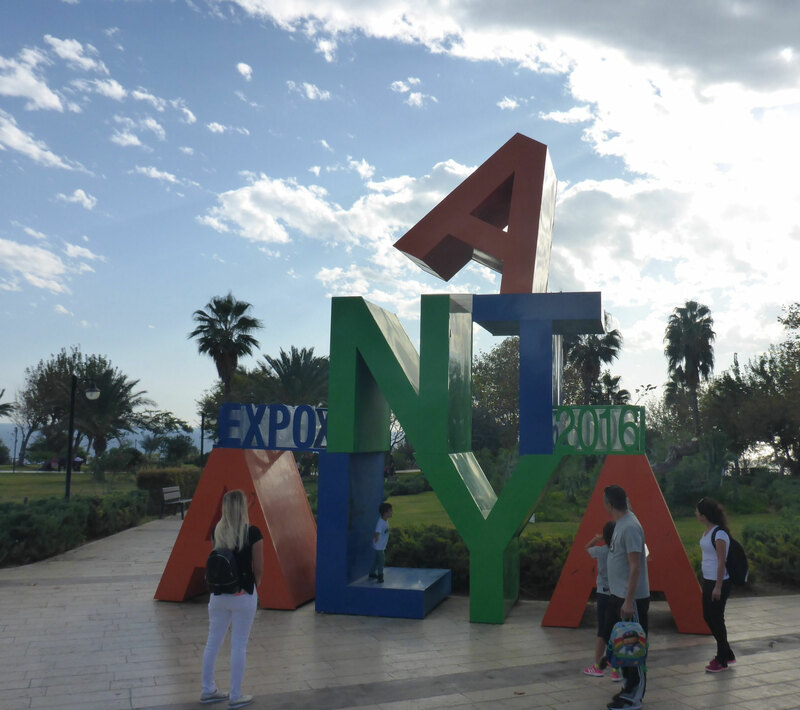 Antalya is the fastest growing city in Turkey. A few decades ago it was still a small town with a few ten thousand inhabitants, but as soon as tourism discovered the marvelous possibilities here in the region, the city grew to impressive 2.2 million inhabitants. In addition the tourists who come here mostly from Russia and Germany. The picturesque old town with the small port, the buildings from Ottoman times and the little streets make a nice atmosphere and the parks on the steep coast offers enough space, green and paths for relaxing, kite flying, strolling, cycling or a cozy enjoying a sip of Turkish coffee. 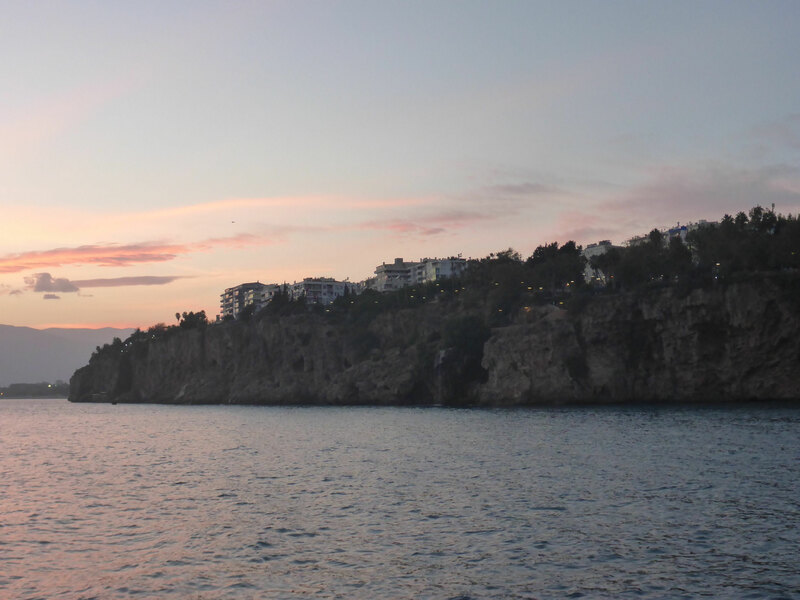 And the steep coast is also used in the evening hours as a meeting point for a glass of wine or beer. With Gonca and Merve I’ve done the same, of course. The city has not much to offer in historical sights, because it was very unimportant until recently. A few Roman remains and the "broken minaret" are all there is to see. prospects, but directly through the city flows the river Düden with its waterfalls. 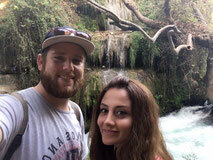 Together with Aylin I visited the, unfortunately very touristic waterfalls. First we drove by Dolmus upstream into the hinterlands. 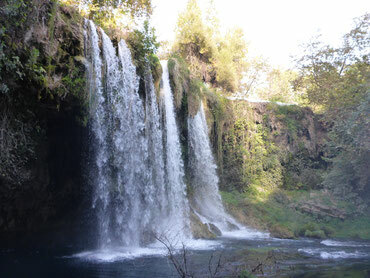 Here the municipality has built a beautiful recovery area and tourist attraction around the upper waterfalls. Many small bridges, barbecues, restaurants and green areas are set up around the impressive falls. The roaring water not only falls deep, but also forms a torrent in its continuation. Centuries old trees line the river and the caves that formed around the waterfall offer a lot of fun and unique views of the waterfall. Unfortunately it is forbidden to swim in the vicinity of the waterfall or even to enter the water. The security did not allow me to try. Too bad. Even at the second gigantic waterfall, which also marks the end of the river, I could not find a way to get near the roaring water even after an hour of trying. 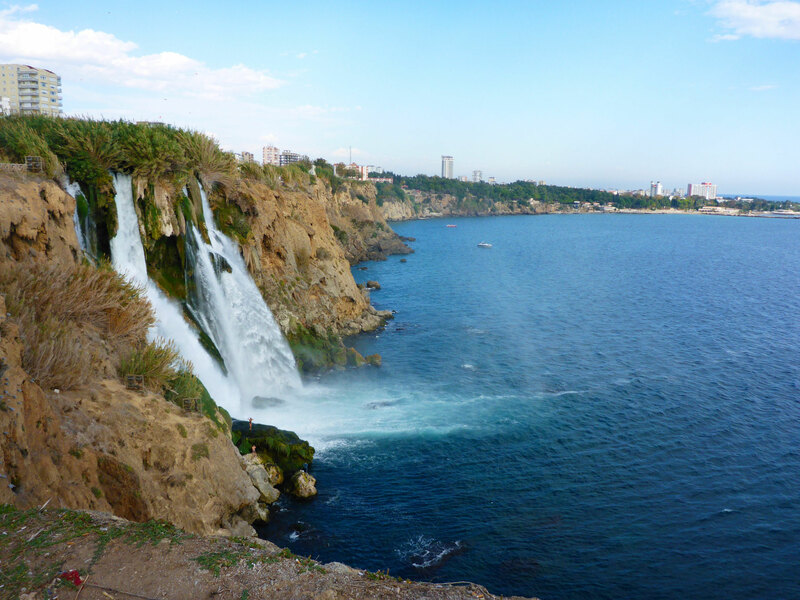 In the middle of the city the water crashes the 40m high cliff into the sea. A breathtaking spectacle, a crazy noise and an almost meditative view. 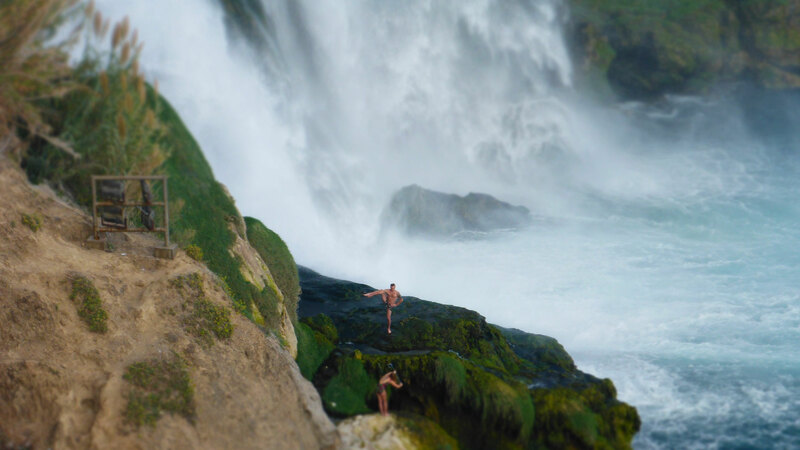 The waterfall is the landmark of the city and, of course, they take care that no one falls down the cliff or hurt himself while trying to get into the water. I should have made it like the few people who did it. Rent a boat and approach the waterfall from below. But Aylin and I spent some time here and enjoyed the happenings very much. 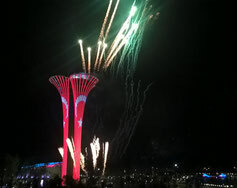 happening this year by Turkey in Antalya. A financial disaster for the country. 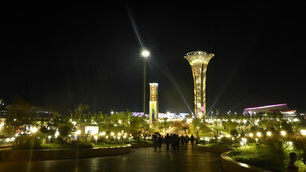 Millions were invested in infrastructure and the exhibition itself, and the political situation led to the fact that the visitors and even parts of the exhibiting countries stayed away. But what the Turks built up here was awesome. For me as an eventmanager very interesting and of course also as a traveler it was great that the EXPO is just here. So we drove with the newly built tram to the exhibition grounds outside the city. An enormous area with conference buildings, museums and the country gardens was to be explored. This year the countries presented themselves through the theme of botany, gardens and sustainability. Thus every exhibiting country has created a garden to present itself and its botanical peculiarities. And yes: the German pavilion had also garden dwarfs. Since we had only arrived in the dark, I unfortunately could not invest so much time to get to know the country gardens. I would have liked to have a full day here, but as the chance is mostly, today was the last day of the exhibition. Since the exhibition is running for half a year and I come on the last day. Lucky me! So we could at least enjoy the final fireworks, which sadly has underwhelmed my expectations. Disappointing. 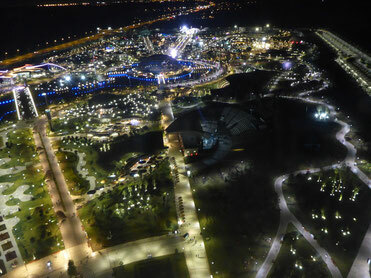 But after all we could climb the exhibition tower by elevator to get a glimpse of the bright area. 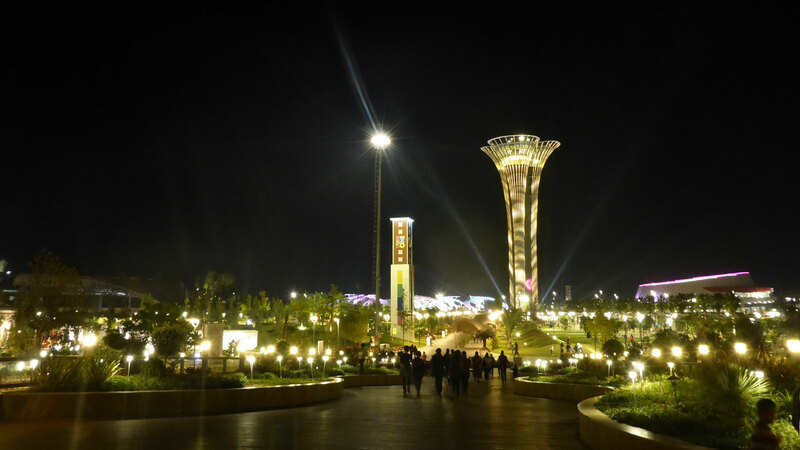 The question arises, of course, how sustainable it is to put this gigantic, artificial area into nature and then philosophize about sustainability and lure tourists into their own country. 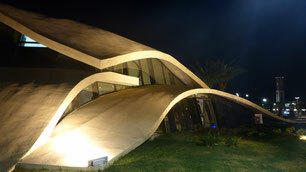 But I liked it and I value a visit as absolutely worthwhile and interesting. Oops?! I know this guy! 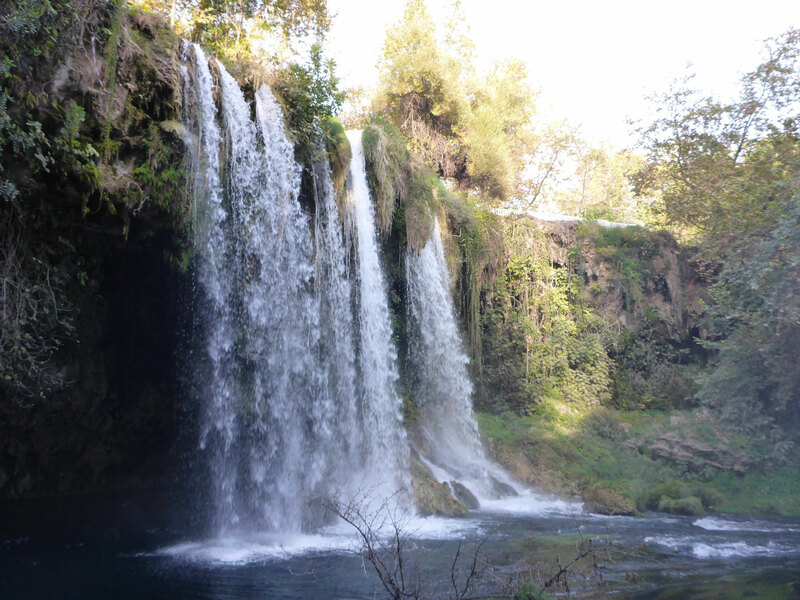 I had discussed with Janosch (Cycling for Nepal) that we could meet in Antalya once, but we were both greatly surprised when we suddenly stood side by side at the great Düden waterfalls. The world is so small. Still on the spot we decided to start a joint tour again. This time we were accompanied by Frank (D), Janosch's father who was visiting Antalya. Rather, I tended to accompany them. We went to withe water rafting in a canyon about 1.5 driving hours from Antalya. 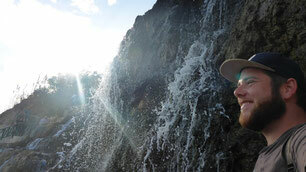 The two run an outdoor camp in Bavaria and are experienced paddlers. But since I like to try new things lately, I have also invested here, at a good price, some money in experience. With a group, we went about 3 hours down the river. It was nice. Yes, unfortunately not more. There were a few rapids, but I was a bit confused. I had expected more action. It was nice to have a charming view. Only nice ... We had a lot of fun to comment on the endless sales attempts of the crew. Partially we felt like on a coffee trip. But that’s the way it is in one of the most tourist areas of Turkey. 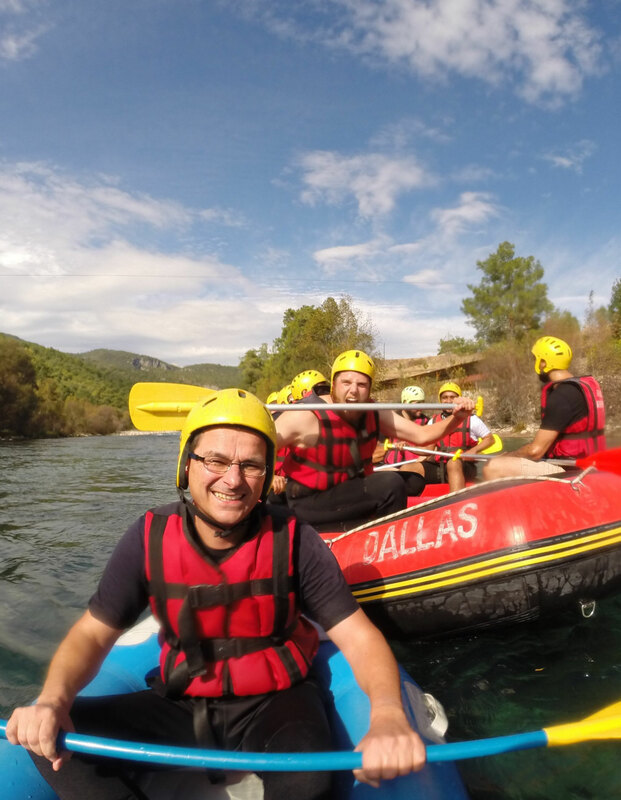 I have definitely got a first impression of rafting and I liked it. But next time I have to make sure that some more action is offered. On the evening before my departure, Michal (PL), another Couchsurfer, came to Gonca's apartment. He has also been traveling in Turkey and Georgia for months and will soon be going to Iran. We talked for a long time and spontaneously decided to travel the next day together. And this time we were hitchhiking. After a portion of half chicken with rice, we also found relatively quickly a Turkish businessman who has brought us to our next destination. 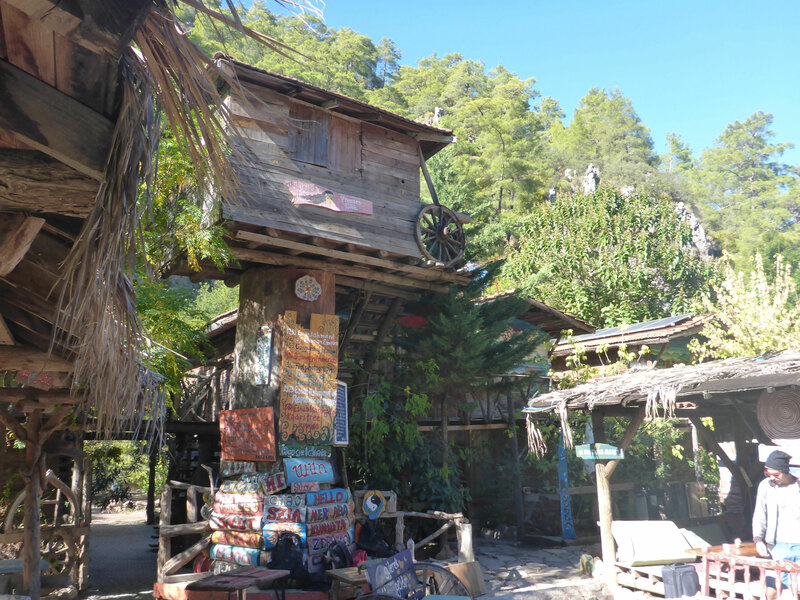 The small, alternative tourist village of Olympos. A Turk had recommended to spend a few days here. And he was right. Michal was not to make this experience, however, since he still changed his plans in the car and went to Fethiye. Olympos is unique. Even if the Turks and Greeks are still unanimous, which mountain is the right Olympos. What makes the region unique, however, are the treehouse camps, which have emerged here over the course of time in a - now unfortunately former - nature reserve. A few hippies started with it a few years ago and now it is the address for backpackers, alternative and also climbers in the south of Turkey. Kadir's Tree Houses is the oldest, most famous, most visited and also the only camp which has opened all year. In fact, there are only a few original tree houses here in the village, but there are many beautiful cottages, restaurants and bars built of untreated natural wood. Through these facilities, the alternative inhabitants and travelers creating an extraordinary, interesting, friendly atmosphere. 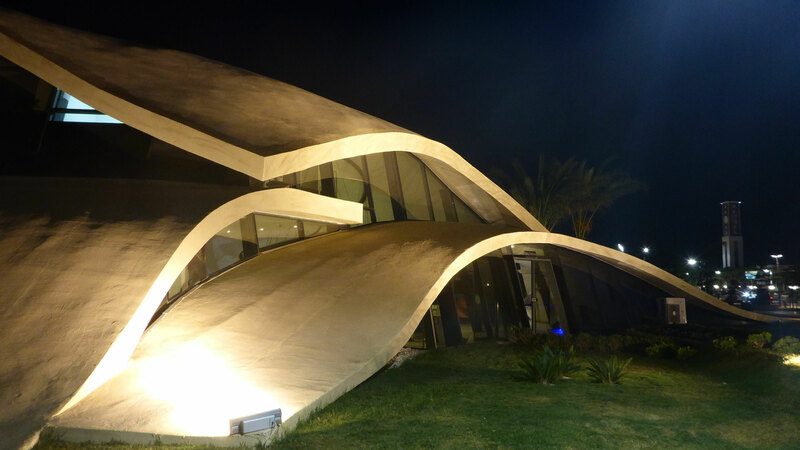 And for 10 € the night including breakfast and dinner also at a more than fair price. Of course, I've met wonderful people here. But again I had arranged to meet Janosch here. He still stayed with his father in Antalya and then cycled after me. 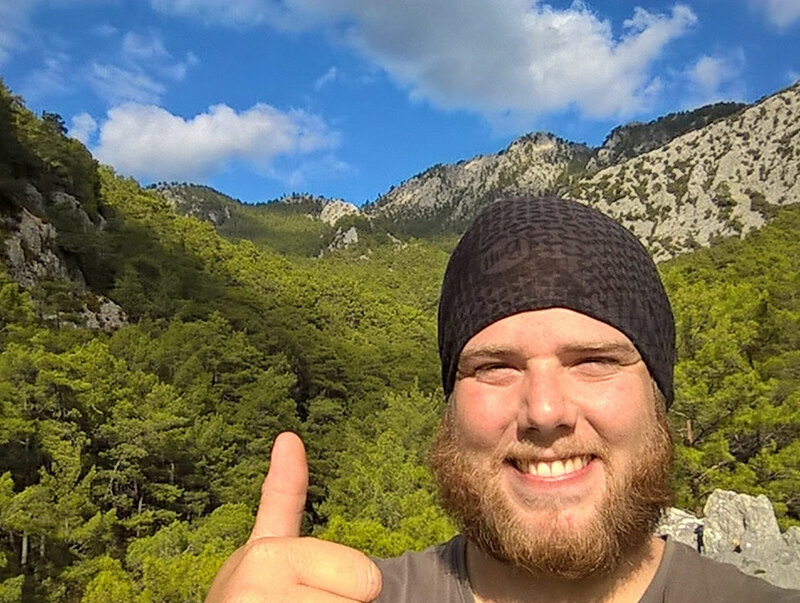 So I decided to do a hike for one day on the Lycian Way. 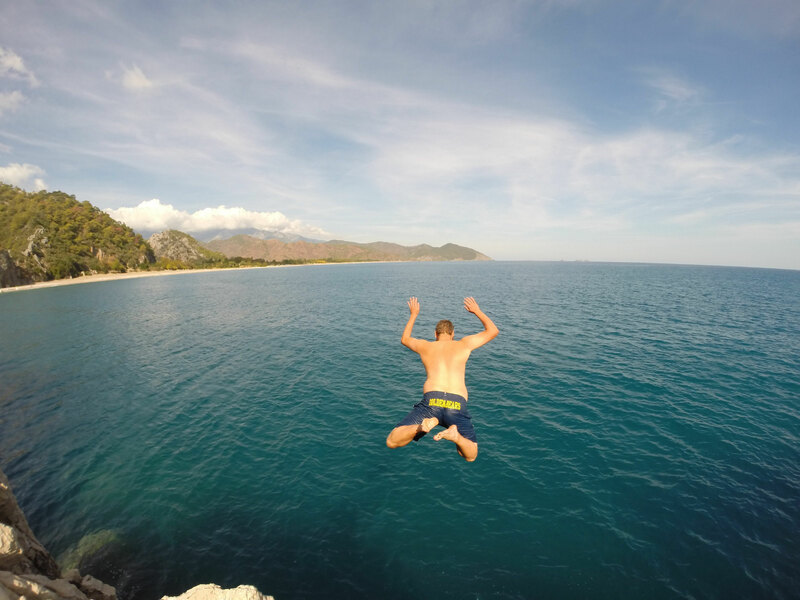 I tried another part of it in Fethiye already. The way led me through the ruins of the antique village of Olympos directly next to the treehouse camps. A beautiful etap through the forest and the mountains. But after a while I had to climb a rock about 20-25m height to have a look above the trees over the valley. On my way back I passed endless fields of oranges and lemons until a friendly Turk picked me up to drive me back to the treehouses. 24km with ups and downs were quite enough for me to hike on one day. But of course the muscle sore did not hold me back to play some nice songs around the bonfire. Almost every night we sat together, talked, sang and shared experiences. Very peaceful and nice. There could have been more People around, but regarding the political Situation a lot of tourists, even backpacker, avoid to travel Turkey right now. And for the Turks it's already winter. But we were a small and fun group anyways. I liked it! 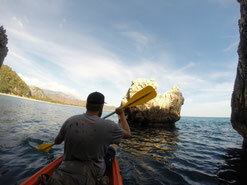 When Janosch arrived at the camp, we hired a kayak to explore the coast on the waterway. 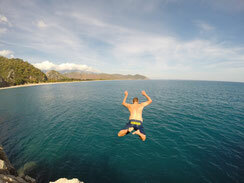 Of course, we did not miss a single rock in the sea to climb and jump into the still pleasant warm water. It was really fun. A few kilometers further, however, our kayak was filled with water because of the waves. Which is not only unpleasant to paddle, but I had completely wet equipment again. On the steep coast, we managed somehow to get the kayak upside down to get the water out, but after 30 seconds our efforts were in vain, because new water swapped in. We just laughed about it and made our way back to the beach. Of course, such two hours won’t leave me without a trace. But a muscle ache mostly testifies good experiences. 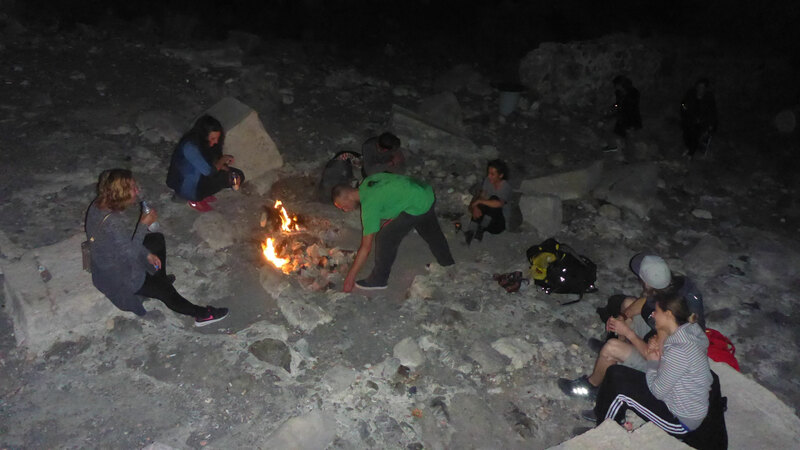 After Janosch and I also climbed the rocks in Olympos for a day, we mobilized in the evening a large group in the camp to visit the main attraction of the region. This mystical place was said to have been the home of the hybrid creature Chimaera. A monster that was shaped like a lion at the head, a goat in the middle, and at the end like a snake / dragon. The hero Bellerophon finally managed, with his winged horse Pegasos, to kill this monster. What the Greeks have probably brought to this legend is a rare geological phenomenon lasting several thousand years. 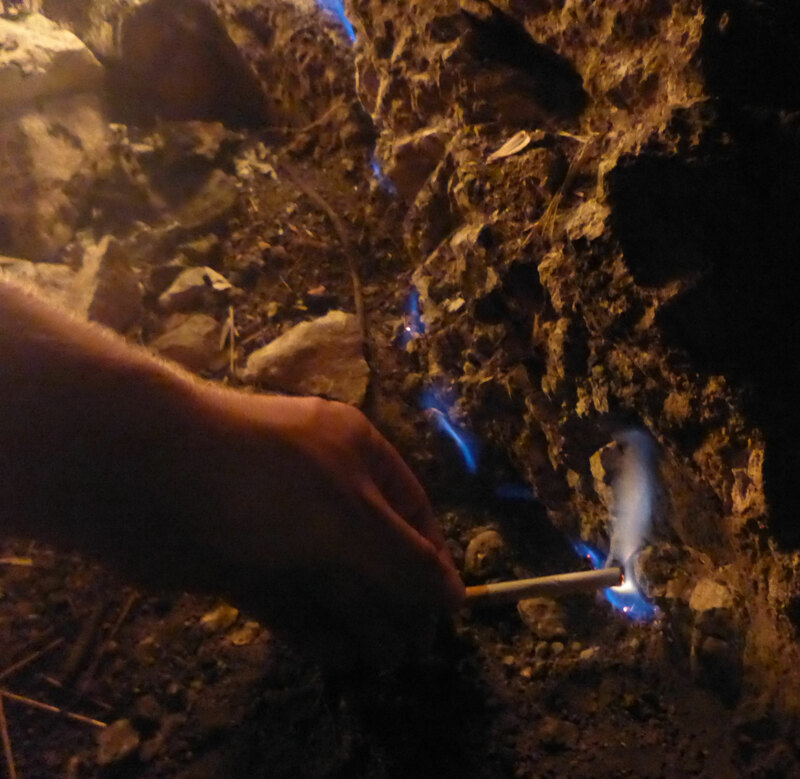 Passing through small fissures and openings, flammable gases are released and the rocks appear to be burning. Today, the flames are still about 50 cm high, but in ancient times meter-high flames have already pointed the way to sailors. 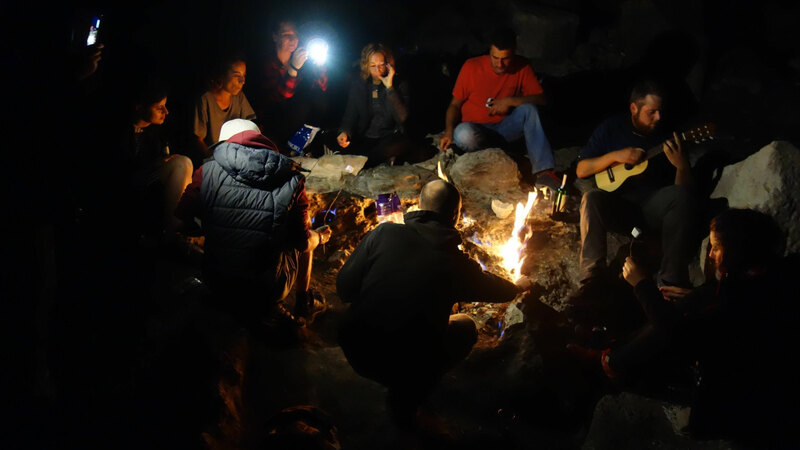 So we went with twelve friends from the camp on a nice night trip to the nature spectacle about 7 km away. And it was worth the trip. It is indeed a magical place. 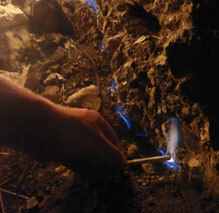 From countless cracks, intersections, holes are thousands of small flames to be discovered. 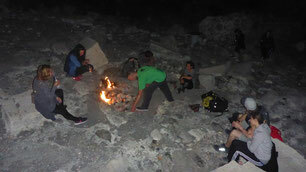 A few large fireplaces are also to be found and so we made ourselves comfortable at one of these "burning stones". We played, grilled marshmallows and enjoyed the flames. We let flames go out and ignite them again. An amazingly interesting and impressive phenomenon. I have not experienced this before. And it is also handy. A camp fire without large smoke development and without wood. Perfect. 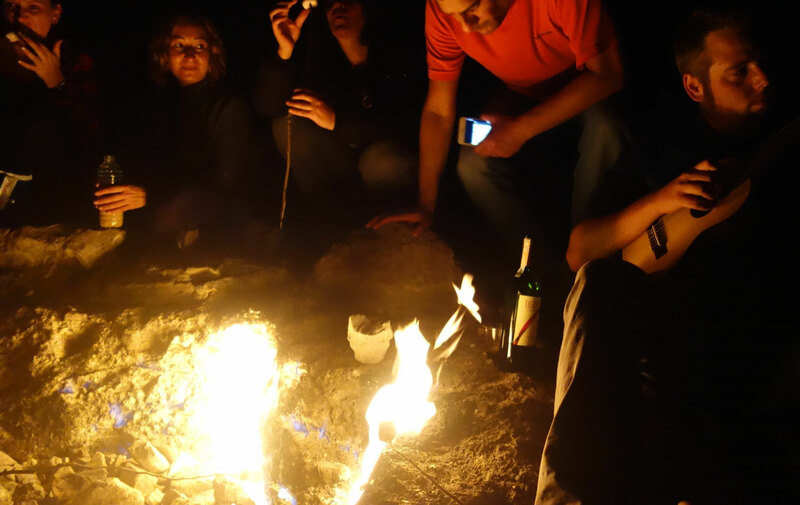 We spent a lot of time on the flaming mountain and were finally the last who enjoyed the stars and never ending flames. But at some point we made our way back again and arrived in the early morning hours. 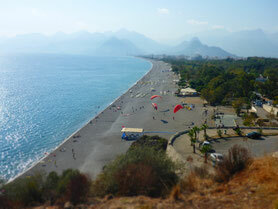 It is a recommended region here around the Turkish Olympos. And I'll get to know them even better. Together with Janosch and Dave (D), we decided to go to one of the world's best climbing areas for rock climbing. Since Dave's sister Helene unfortunately had to go back to Germany, but provided her rental car, the next day we went the 90km to Geyikbayiri by car. I will hopefully report you soon what will happen there. - Aylin teached me some Turkish words ... at least she tried hard. I just not getting used to the language. - I even briefly talked to Aylin's mother. She once lived in Germany and had not spoken German for 25 years. That was very interesting. 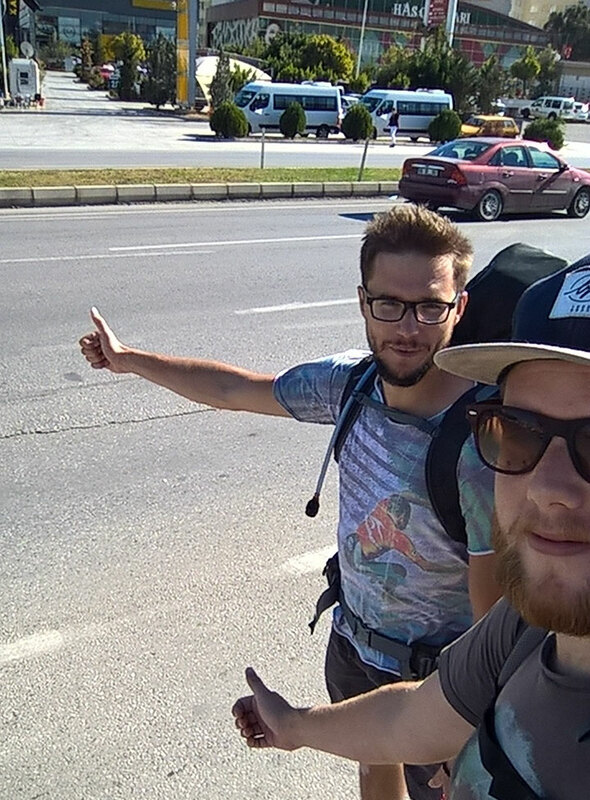 - In the hitchhiking to Olympos, we entered a military control. Of course, Michaels and my backpack were searched for bombs etc. too, better this way. - To get from the tree house to the beach, you have to cross the archaeological area of the ancient city. 1 entrance 20 TL, 10 times pass of 7,5 TL. Of course, the pass of 10 is not advertised. - Maximum Banana! In a neighboring camp lives Maximum. A totally crazy guy at my age who already camps 2 years here. For him everything is maximum! Maximum Energy, Maximum Love.